When I was little in all the fields that my parents worked (in their case rented) there was a one that was particularly special. It had in fact the characteristic of being bordered to the right and left by a row of of fig trees. The owner of the land had enjoyed planting different varieties he had obtained during his travels. 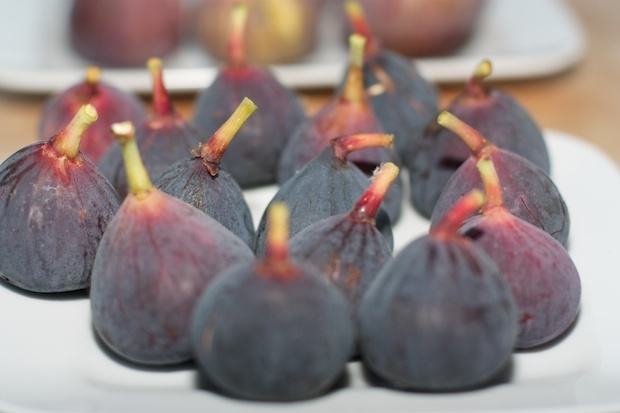 So from the first day of the month of June (when the fig flowers ripen) until the end of September, going out into those fields was quite wonderful because we always had a delicious feast of figs. Tomatoes are said to be the most widely used vegetable in the world. Tomatoes originated from the Andean Cordillera between Chile and Equador. The Incas were the earliest cultivators of this vegetable. Tomatoes are rich in minerals and trace elements. Potassium predominates over all and helps our body to regain water balance therefore reducing water retention and fatigue. They also contain phosphorus, calcium, iron, zinc, selenium and fiber, a true elixir of health. With this knowledge it is worth it to grow tomatoes! 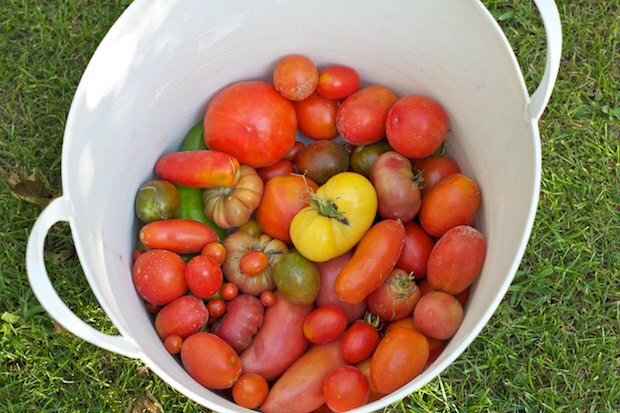 Tomatoes can be grown in pots. If you have a garden, try growing some tomatoes maybe near the fence so that you can use it as a support. Tomatoes in fact need support to grow. Cultivation requires the knowledge of cultivation techniques to make sure you have a good product, if you want to try out some new plants, it’s easy today to find new types on the internet from the comfort of our house. In any case, the most beautiful and satisfying things is to prepare a salad with crops from the garden. In Italy there are about 320 varieties of tomato. The photo shows several varieties that the recently deceased architect grew in a corner of my house. Cherry trees are quite beautiful and if you have a yard big enough think about planting at least one tree. Cherry trues have beautiful blossoms in the spring and juicy fruit in late May and early July depending on the variety you choose. During the summer these trees will ensure some pleasant shade. This tree does not require great care in growing and requires no special pruning other than those for containment. It is a tree that becomes very large but today there are also smaller varieties in the market. Although this plant may be susceptible to diseases we leave it alone and let nature draw its picture. Cherry trees are native to Europe and Asia. The most popular varieties in Italy are “durone” from Vignola, “ferrovia” from Apulia, and “graffione bianco” from the Piedmont region. All three varieties are on the table that you see represented for the month of June. 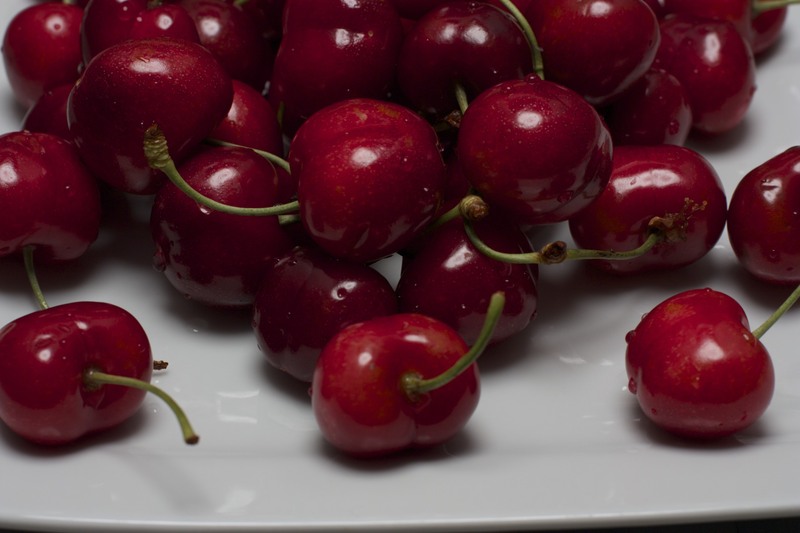 Cherries have purifying properties and help detoxify and prepare for our body for the summer heat. A curiosity: the variety “ferrovia” began to spread in 1935 by a railroad crossing “Sammichele di Bari” (the name of this railroad) where a tree was growing and whose seed was brought by some bird. This year the winter was long and cold in the region where I live. In the early days of March, the garden seemed lifeless. During the first sunny day when I came out to explore, I realized that among the bare branches and dead leaves there were still no signs of life. 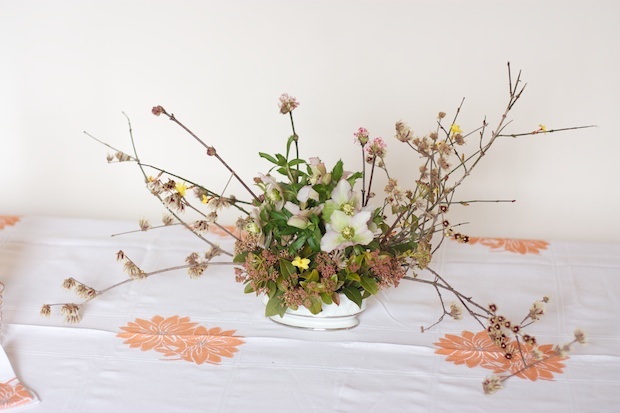 Finally under a fir tree centenary, including branches and leaves I found that were blooming hellebores, I constructed a floral arrangement and the result is the centerpiece that you see. 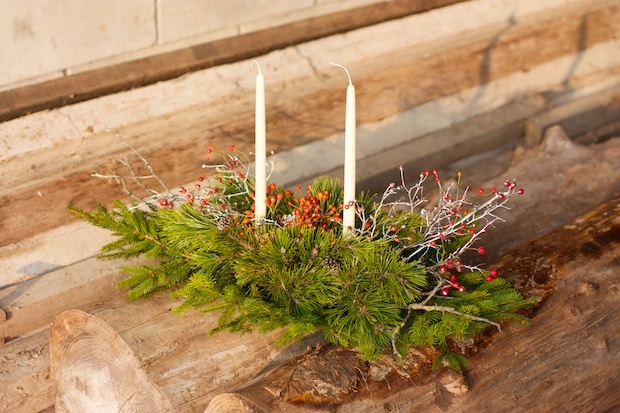 A centerpiece helps to set the mood at Christmas. It is important to use simple natural elements, collecting things from the garden or from a walk in the woods or fields. I propose some compositions that I prepared using only the elements that I personally collected. This month you can begin planting new trees in the garden or terrace or at the edges of the garden. 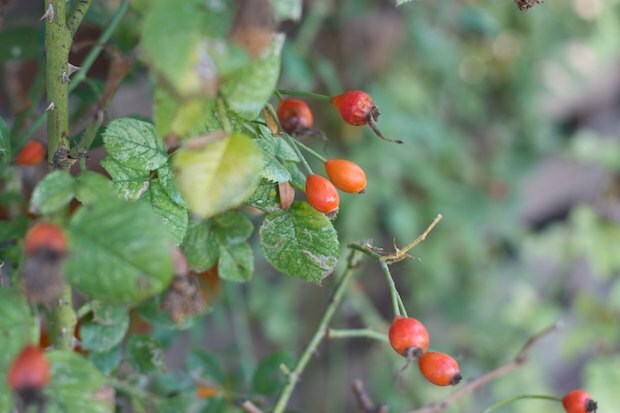 If you enjoy color in the winter months, I recommend planting shrubs that produce colorful berries in autumn. This way you will be able to collect useful elements to decorate the house, the table, and to use as cooking ingredients. Pumpkins require a lot of space but they can still be grown in gardens, a home garden, or in pots. 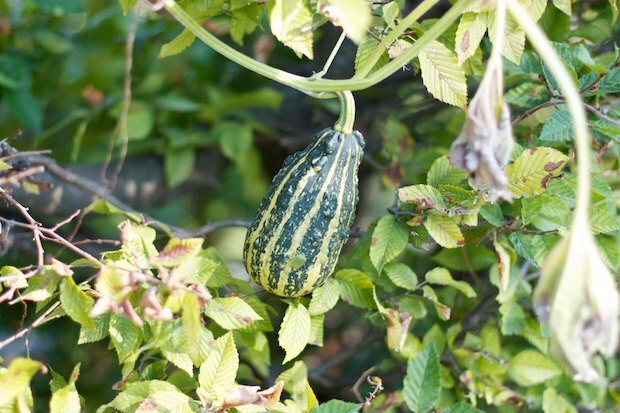 If you have a terrace, you can experiment with the cultivation of a pumpkin plant or small decorative pumpkins. They can grow several meters and grow well as a climber. If you have a metal fence or a hedge, you can plant some seeds and allow them to grow and climb on their own. Grapes are not only the ingredient needed to make wine, but also a valuable ally for your health. 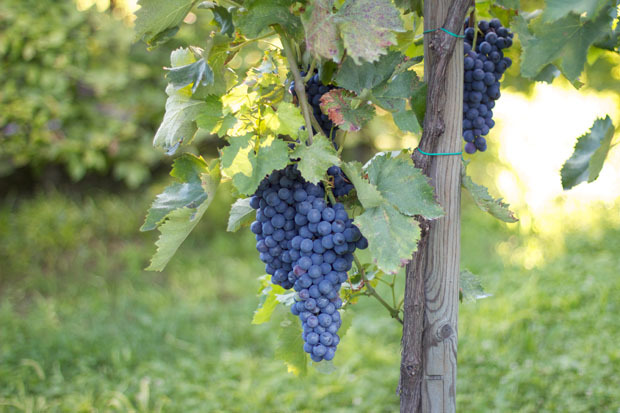 If you have a garden with good sun exposure, you could create a small corner to grow grapes. Under a pergola of strawberry grapes, a variety that does not require treatment and maintenance, limited only to a containment pruning in March, you could create a shady area for outdoor dining in the summer and autumn. The grape clusters give off a lovely fragrance and enjoying a bunch of grapes early in the morning before going to the office can help you cope with a busy day.